Comment: This item shows wear including a gift inscription or name and moderate wear to edges and cover. 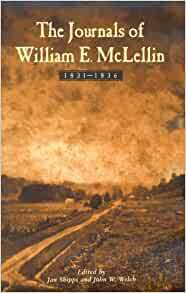 For years, William E. McLellin (1806-1883) has been a mystery to Mormon historians. Converted in 1831, he served missions with Hyrum Smith, Samuel Smith, Parley Pratt, and others. He was also ordained one of the twelve original Latter-day Saint Apostles in 1835. Yet seeds of doubt and difficulty were already evident in his brief period of excommunication in 1832 and in various points of tension and later conflict with Church leaders. In the early 1980s, the fabled McLellin journals were reportedly located by the infamous document forger, Mark Hofmann. Little did anyone know that they were soon to be found in the holdings of The Church of Jesus Christ of Latter-day Saints, which had acquired the journals in 1908. These six detailed and fascinating journals, written from 1831 to 1836 during McLellin's most faithful years, now shed new light on the nature of early Mormon worship and doctrine, as well as on religious attitudes in America in the 1830s. They document his daily travels, meetings, preachings, healings, sufferings, and feelings. They offer many clues toward solving the mystery of McLellin in early Mormon history. Editors Jan Shipps and John W. Welch: Jan Shipps is professor emeritus of religious studies and history at Indiana Univeristy, Purdue Univeristy, at Indianapolis. She is a former president of the Mormon History Association and over the past thirty years has published numerous articles and reviews on the subject of Mormonism. John W. Welch is professor of law and editor-in-chief of BYU Studies at Brigham Young University in Provo, Utah. One of the editors of Macmillan's Encyclopedia of Mormonism (1992), he has written or edited many books and articles on history and scripture. If you are doing research on early Mormonism and particularly early Mormon Missionary work this is a must have. It is a wonderful resource.